It’s easy for rubbish and debris to mount up in a garden if it’s left unchecked for too long. 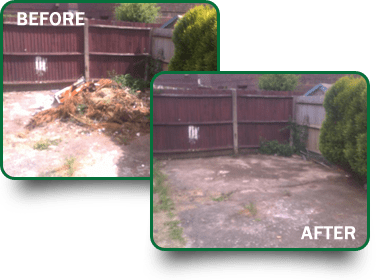 If you love spending time in your garden, but simply don’t have the time to clear away the rubbish that’s spoiling your enjoyment, or you are preparing for a garden makeover and need a clear site, Lucas Waste Removal can help. We provide a complete garden clearance service that’s fast, effective and adapted to suit your schedule. With our easy to organise garden clearance service, rubbish such as rubble, old plants, cuttings and debris can be cleared away quickly and efficiently, with minimum disruption to you. If your view is being blocked by an unsightly shed or disused greenhouse, we can dismantle and clear these too if needs be. Broken walls and garden fences can also be cleared away, leaving you with a tidy view to enjoy every day. You can book a time with us that works around your schedule, and there will be a two-hour window of arrival for our team. We will then call you half an hour before we arrive on the scheduled day, and begin the garden clearance. We will bring brooms, buckets, shovels, rakes, and rubble bags, and will remove your garden waste as quickly and cleanly as possible. Your house will be protected from debris and we will make sure to use dust sheets if waste needs to be carried through your house. Rest assured we will always treat your property with the greatest of respect. Everything removed from your garden will be disposed of responsibly and recycled wherever possible. Call us today on 020 8773 4000 or 07885 768 939 or use the contact form on our website and let us help you organise a garden clearance service that suits you down to the ground.